For film fans, 2012 has been the year of catalog Blu-ray. We have been inundated with cult classics, fun favorites and bonafide blockbusters. Now one of the biggest blockbusters of all time is finding its way to Blu-ray on August 14, 2012 and film buffs are counting the days. The arrival of any Steven Spielberg film is hotly anticipated in hi def, but none more than Jaws. The 1975 thriller was the first film to be labelled a ‘Summer Blockbuster’ and every bit of praise that can be heaped on the toothy classic is well deserved. Martin Brody (Roy Scheider) is the sheriff on Amity Island. Which is ironic since he isn’t too fond of water. When the remains of a swimmer are thought to be the result of a shark attack, Brody wants to shut down the beaches until the shark can be caught, but tourist season is upon Amity Island and the city is not about to throw that money away. When a boy is killed by the shark shortly thereafter, the mother of the victim puts a bounty on the sharks head and suddenly the island is full of amateur hunters and fishermen all looking for fame and fortune. So Brody must team up with a local fisherman known for his shark hunting skills (Robert Shaw) and a man from the Oceanographic Institute named Matt Hooper (Richard Dreyfuss) to catch the Great White before it claims more victims. I say without exaggeration that everything about Jaws works. The direction, the performances, the music, the script, the locations, the effects. Everything about Jaws is pitch perfect and movie making just does not get any better. Jaws also seems to defy time itself as it does not play out as being dated in the least. Some of the clothes betray the films age, but besides that it plays as fresh today as it did 37 years ago. And the dialogue between Scheider, Shaw and Dreyfuss is just mesmerizing. Jaws will always serve to remind us that Spielberg was, is and probably will always be one of the best storytellers in film history. And then there is the shark. Infamously the shark did not work as well as Spielberg wanted and he intended to show it much more than he did. The fact that they did have so many problems with the mechanics of the shark was destined to be, because it forced the filmmakers to utilize other methods of creating tension. And man did it work. The Blu-ray from Universal is simply perfect. I could never have imagined Jaws looking this good. The transfer retains the film’s wonderful grain, but at the same time the colors are more vibrant than they have ever looked, the blacks are nice and deep and the clarity and detail are incredible. This is absolutely THE definitive edition of Jaws. And the best part is when you are done watching the film and you are sitting there wishing it was 4 hours longer; you have an extensive collection of special features including TWO feature length documentaries on the film. And I am telling you, both documentaries are almost as good as the film itself. 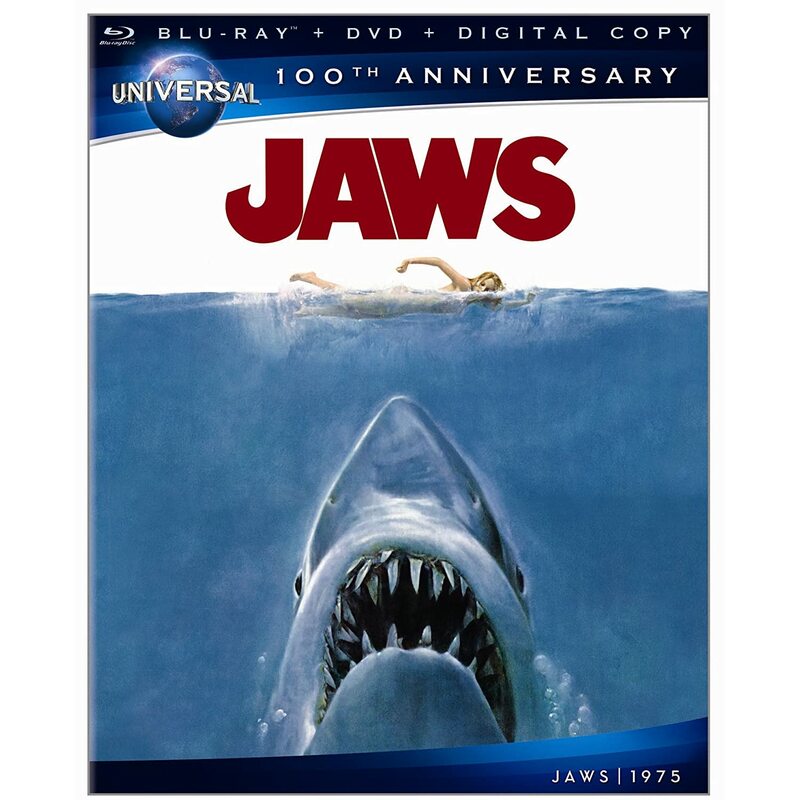 Not only can you sit down and enjoy Jaws in all its perfection, you can have a Jaws marathon day watching all of the content of Universal’s 100th Anniversary Edition. If you buy anything for your Blu-ray collection this summer, Jaws is it. Extremely highly recommended.